It is a million dollar murder mystery. 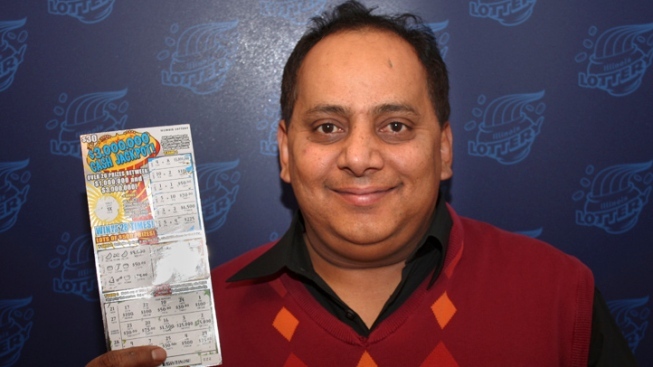 Chicago police were working to determine if there is a link between a north side businessman’s good fortune in the Illinois Lottery and his apparent murder on the day before he was to have collected his winnings. "He was a family man who worked hard for his family," friend Jimmy Goreel told NBC Chicago. "I just can’t see it happening. If that’s true, it’s sad." The victim, 46-year-old Urooj Khan, bought a winning scatch-off ticket at Goreel’s convenience store on North Western Avenue last July. Goreel said he was elated. And it wasn’t his first jackpot. "I sold him a winning ticket for $5,000," Goreel said. "He was so generous he reached for a hundred dollars, and he threw it on the counter for me." Khan, the owner of three dry-cleaning businesses on the north side, posed with a cardboard check with his family, in celebration of his million dollar windfall. The state cut him a check for his winnings -- $424,449.60 after taxes -- but Khan never saw the money. He grew ill the evening of July 20 and was pronounced dead at St. Francis hospital. Khan’s death was initially attributed to natural causes, but a relative phoned the Cook County Medical Examiner’s office and asked investigators to take another look. "They had concerns that it was deemed a natural cause of death and wanted us to look harder," said Medical Examiner Dr. Stephen Cina. "And we did." And Cina says when his investigators took a second look at the toxicology samples, they found lethal levels of cyanide. "It is a very lethal drug," Cina said. "It’s a chemical poison. It basically asphyxiates you at the biochemical level, so a little goes a long way." Cina said the next step will probably be to exhume Khan’s body. At his Western Avenue cleaners, the victim’s wife declined a reporter’s request for an interview, but said her husband was a "kind and good-hearted person."